Barbecuing is an Australian past time, it brings people together in the open air inspiring a relaxed, happy and carefree atmosphere that just cannot be replicated indoors. However, choosing the right BBQ or Outdoor kitchen to enjoy on your deck is not as simple as selecting one for your backyard. It is important to consider your entertaining style, the size of the deck, what fuel to burn, ventilation (if a covered area) and placement; to make sure it is a safe distance from combustible materials. HardieDeck™ boards are made from premium fibre cement which is deemed non-combustible, is designed for use in bushfire areas up to BAL-FZ, and is safe for use around BBQs and fire pits. Make sure that your deck is designed to be strong enough to support your BBQ or outdoor kitchen, always check with your builder before installation. Make sure that you locate your BBQ in a highly ventilated area, as fumes and gases emitted may be harmful and avoid placing the BBQ near anything combustible. This includes flammable fuel such as cooking oil, lighter fluid, firewood, furnishings, plants and railings, especially when using charcoal grills. If you have any concerns regarding grease and oil stains around the BBQ, you can use protective BBQ deck mats or grill pad mats.However, if your deck is fully exposed, ensure that these mats are packed away when the BBQ is not in use, as moisture will collect beneath them. Domestic outdoor BBQs must have a suitable clearance from the building (always follow the relevant manufacturer’s instructions), ensure there is a minimum vertical clearance of 1,200 mm between the BBQ cooking surface and the ceiling, roof or overhead cover to avoid the risk of combustion occurring on surfaces laden with grease deposits. If using an outdoor fire pit as a BBQ, please refer to the guidelines for fire pits. Never leave a BBQ unattended. Keep pets away and supervise children at all times.If a gas BBQ, when not in use ensure the gas is turned off at both the cylinder and BBQ. Accidents can happen - always keep a fully-charged appropriate class of fire extinguisher nearby to deal with any mishaps. 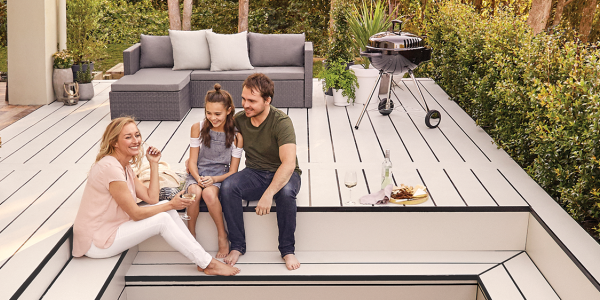 If you want to make sure your deck makes the grade and creates a safe place to entertain, rethink traditional decking options and ask for HardieDeck™ decking by name. 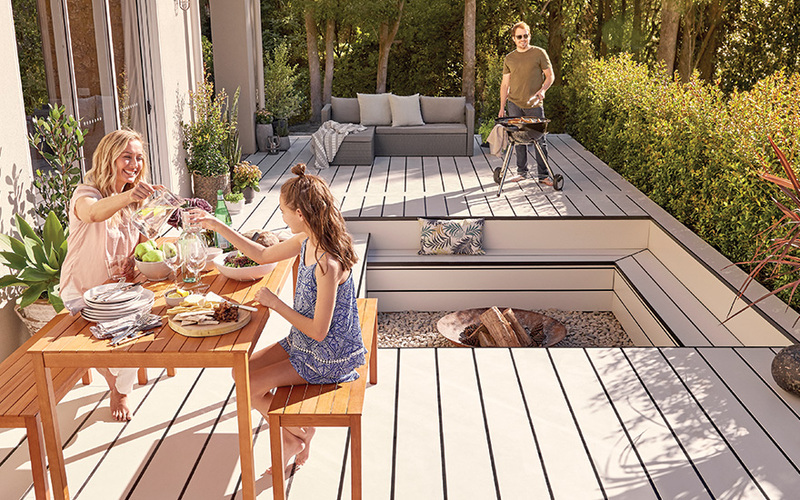 If you want to make sure your deck makes the grade and creates a safe place to entertain, rethink timber and lesser decking options and ask for HardieDeck decking by name.